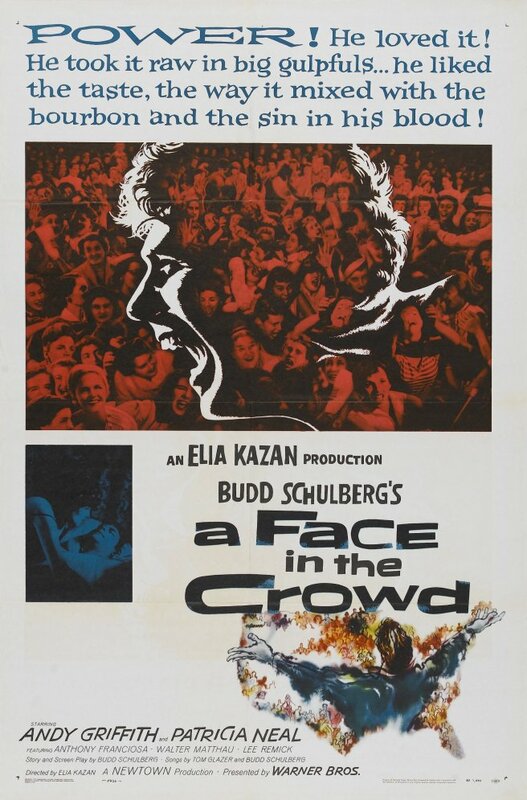 A Face in the Crowd (Elia Kazan, 1957) – Make Mine Criterion! Andy Griffith made an unforgettable screen debut in this film as Larry “Lonesome” Rhodes, a cracker barrel philosopher discovered by Marcia Jeffries (Patricia Neal), who puts him on her local TV station in Arkansas. His down-home wit and backwater jokes soon gain a wide audience, after which one of the state’s largest stations picks up his show, followed by a network, until his face is seen throughout the land and his homespun wisdom becomes the creed of large numbers of Americans. But Jeffries and her assistant, Mel Miller (Walter Matthau), soon realize that good old Lonesome Rhodes is not the kindly rural savant he appears to be. The corporate TV executives who make jokes behind his back little realize that Griffith is actually a shrewd, power-mad con artist, cynical and hateful at the core. He begins to use his influence to promote certain firms and politicians, with a payoff in money and power, then makes a deal with a presidential hopeful and pushes the candidate’s image, expecting a bonanza of riches, prestige and clout once the man is elected. Off camera, Griffith reveals his true nature—obnoxious, insulting, and venomous. A fact Jeffries, who has become his secret lover, witnesses firsthand and feels compelled to expose. Director Elia Kazan and writer Budd Schulberg, who collaborated so effectively in ON THE WATERFRONT, again proved their ability to produce a raw, penetrating and terrifying portrait of humanity in this timeless work. Without question, A Face in the Crowd is Andy Griffith’s film. Still years away from The Andy Griffith Show and his role as a small town sheriff that forever defined him as a paragon of common sense American virtue, Griffith had cut his teeth as a stand-up comedian and was starring on Broadway in Ira Levin’s No Time for Sergeants when he went out for drinks with Schulberg and discussed the developing project. Schulberg thought Griffith was too nice to play Rhodes, but the next day Griffith performed an impression of evangelist Oral Roberts for Schulberg and Kazan and won the role. (Griffith had studied to be a preacher before concentrating on singing and guitar-playing.) The dissonance of watching the film today, of seeing Sheriff Andy Taylor given in to greed, lust, and megalomania, is assuredly the film’s greatest draw and thankfully Kazan explores Lonesome Rhodes desires and failings from a multitude of angles. Kazan called Lonesome “a truthteller in a hypocritical civilization,” implying Rhodes’ outsider status and a social context ripe for exploitation. Griffith plays Lonesome as a trickster par excellence right from the start of Kazan’s film. While he thoroughly charms Marcia and his fellow drunk tank inmates with his down-home banter and his boisterous performance of “Free Man in the Mornin’,” his impromptu show only comes after first securing his freedom from the sheriff in exchange. From there, Rhodes is coaxed into becoming a local radio personality and his growing popularity eventually leads him to a nationwide TV show based in New York City. Rhodes’s various tricks (running down his mattress-selling sponsor, livening up a phony medication, marrying a young majorette, loosening up a would-be Presidential candidate) are sugared with his sometimes stated/sometimes unspoken disclaimer, “Shucks, I’m just a country boy!” In doing so, they recall Tom Sawyer whitewashing a fence or Br’er Rabbit being flung into the briar patch. Lonesome Rhodes most consistently drew comparisons to Arthur Godfrey, a radio and television personality whose folksy image belied an aggressive and defiant personality off the air (Kazan and Schulberg notably sat in on advertising meetings for Lipton’s Tea, to whom Godfrey was a pitchman), and Will Rogers, a popular comedian and columnist of the 1930s who identified with the common man but spent his private time rubbing shoulders with politicians and bankers, however Rhodes stands-in for all manner of wanna-be good ol’ boys ready to utilize an “aw, gee” attitude for financial gain and possible entry into the presiding Establishment – think Elvis, despising his films and their audience and happily reaping their rewards, or every other politician who finds a pair of blue jeans and a Southern accent each time the campaign crosses the Mason-Dixon Line, happily collecting votes in the process. Kazan’s film is crowded with arresting faces. Griffith is shifty-eyed and calculating at times, lip-smackingly lecherous at others, manic and wild-eyed by the end – an absolute tour de force from an untrained actor in his cinema début no less. Patricia Neal (returning to Hollywood four years after an affair with Gary Cooper and a nervous breakdown) is spellbinding – warm and generous as she stares in wonder at Lonesome early on, severe and skeletal as she sits drenched in black and left watching Rhodes on a bar TV, anguished and spent by the film’s conclusion. Walter Matthau’s comedy writer, Mel Miller, is sardonic gold, a cool, Arthur Miller-esque, rationalist Northerner observing behind black-framed glasses and playing yin to Lonesome’s instinctual and indelicate Southern yang. Anthony Franciosa grins like a puffed up weasel as Rhodes’ agent, Joey DePalma, and Lee Remick (in her film début) twirls with kittenish abandon. Peppered between these bravura characters are all manner of other faces briefer in screen time but no less remarkable – sweating sheriffs, screaming adolescents, frustrated sponsors, dim lackeys, and stuffy politicians – as well as contemporary media figures like Mike Wallace and Walter Winchell who add to the credibility of this dark reflection of television’s Golden Age. Remember, this was Eisenhower’s time, and Eisenhower won the elections because everybody looked at him and said: “There’s Grandpa!” We’re trying to say: never mind what he looks like, never mind what he reminds you of, listen to what he’s saying … We were also saying, however, that television is a good thing. Abraham Lincoln said: ‘Tell the people the truth, and they will decide what to do.’ Well, we said that television is good for that – it’s a better way. Television deludes some people, exposes others. Democracy depends on some basic, indissoluble intelligence and goodness in people. It assumes that if you tell people the facts, they’ll come to the right decision, which is part superstition and part hope. In this sense, A Face in the Crowd‘s media cynicism feels almost quaint in its idea that anyone is even listening, that those that are listening are interested in being swayed, or that the process will be enticed to somehow “do better.” After all, DePalma already has a new “demagogue in denim” even before Lonesome’s fall, Miller predicts Rhodes’ eventual return, and we all know now that a hot mic is no longer the brand killer it was once. What is important is not its structure but its unassailable spirit, its power, and what I dare call its necessity. The usual fault with ‘honest’ films is their softness, timidity and anesthetic neutrality. The film is passionate, exalted, fierce, as inexorable as a ‘Mythology’ of Roland Barthes – and, like it, a pleasure of the mind. No high definition version of A Face in the Crowd yet exists and so a Criterion Collection edition of the film would fill a existing void. That poster image of a laughing Lonesome would look great on a Blu-ray, while the title and the illustration of Rhodes extending his arms to embrace those United States would look great for a cover image. Credits: The Facing the Past documentary is included on the existing DVD edition. Steven Spielberg was chosen to provide an introduction to the film given his introduction of a restored archival print back in September. The Kent Jones-Martin Scorsese conversation emulates their discussion on Criterion’s edition of Kazan’s On the Waterfront (1954). Spike Lee’s afterword recalls his contribution to Criterion’s Ace in the Hole (Billy Wilder, 1951) and is inspired by his appearance on TCM discussing A Face in the Crowd. Ron Simon was selected to discuss A Face in the Crowd‘s portrayal of television given his contribution to Criterion’s The Golden Age of Television set. Kazan provides an extensive interview on the film in Kazan on Kazan, and so we imagine including it in this edition’s proposed booklet, while historian Foster Hirsch is a friend of the Collection and has previously moderated screenings of A Face in the Crowd with interviews of Patricia Neal and Budd Schulberg. Great article and links! This movie is so underrated. Whenever they get around to it, the AFI should include this on their next 100 Greatest American Films list. Pingback: Criterion Made Mine! The A Face in the Crowd Edition – Make Mine Criterion! You did it! It’s a Criterion now!! !